Indonesia in grieve. So many disasters hit the country. Newspapers, radio and television put this news of Indonesian calamity as their headlines. Some time ago, we heard about big flood in Wasior, Papua. Flood washed away several villages. Many people grieve in Papua. While we, who only hear the news about it can feel nothing but pity. End of October. There was news about an earthquake as strong as 7.2 magnitude on the Mentawai islands, West Sumatra. BMKG mentioned that the quake had tsunami potential. And it was. 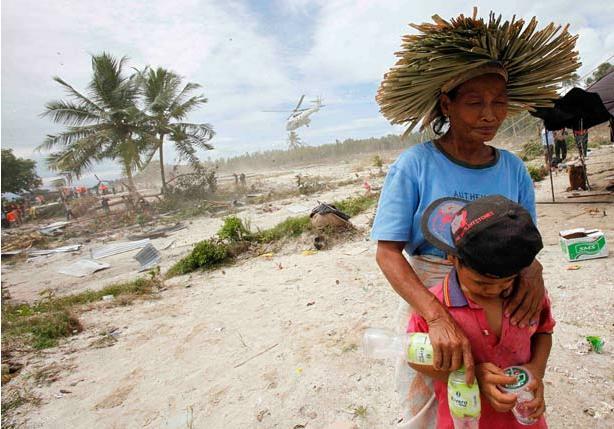 Waves as high as 10 meters of sea water swept the Mentawai region was devastated several villages at once. Destroyed. Families scattered. Hundreds of people died, while hundreds of others missing and still in search. Mentawai islands is located at the western area of Indonesia, at the outer part of Sumatra, quite far from the center of Indonesia, the capitol of Indonesia, Jakarta. The news about the tsunami came to Jakarta quite late, 12 hours after it happened. On the same day, the Mount Merapi in alert status. The signs of its activity has been detected by volcano observers . Residents in the Merapi area are encouraged to evacuate themselves to safer places. Mbah Maridjan, the gatekeeper of Merapi was encouraged to leave his home, located within 5 km from the peak of Merapi. He still refused, until the heat clouds swept down the slopes of Merapi. He was deceased, by Merapi that being guarded by him all the time. In addition, I ask them to save some money, instead of spending it to buy some snacks (which is nearly useless junk food). If they can save some money, they can donate it to the victims of the earthquake and tsunami. Even a little. In my lesson, Arts, I ask them to make pictures of the refugees. I’ll send it to our friends, their brothers in the camps. We can share, show that we care. And finally, of course we send prayers for them, wishing them courage, patience, and strength to live. Hope we can help them with whatever we can. We will do what we can, to help you, my brother and sister. Since you are… also Indonesia. We grieve for you. This entry was posted in Global Action, Indonesia and tagged artwork, disaster, empathy, Indonesia, my students, sympathy. Bookmark the permalink. Thanks for your sympathy for Indonesia.